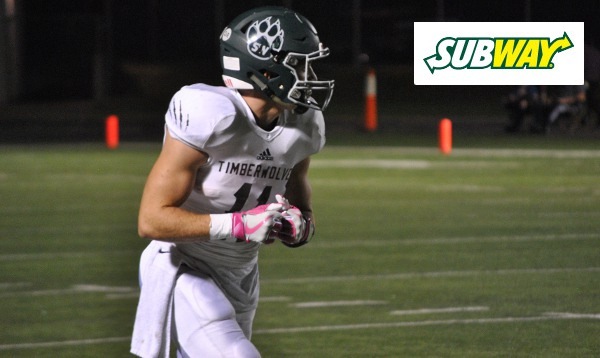 Subway sponsors our Friday Fresh Take where we provide a recap of some of the state's most notable games and performances from Friday night's action. Here’s a look at several of the results that caught our attention from Week 9. The new playoff system is underway in Class 6A and 5A in which all schools are seeded into the bracket based on win/loss record and their season-long scoring margin. The method for seeding teams is strictly objective, and can result in some teams being under- or over-seeded without consideration for their strength-of-schedule (SOS). After one round, or Week 9, there were two “seed-upsets” in Class 6A and three more in 5A. But there were a couple of other “close calls”. The most notable “close call” occurred on the east side of Class 5A where top-seeded KC Schlagle narrowly escaped 16-seeded Topeka Highland Park, 24-16. The Stallions led 16-8 at halftime before the Scots tied the game in the third quarter with a touchdown and two-point conversion. Schlagle took the lead for good on a Brayden Soza touchdown run with 4:56 remaining to win 24-16. The Stallions kept things on the ground in rushing for 270 of their 289 total yards. Why not when you have a workhorse like Cornelius Ruff? Ruff carried 32 times for 165 yards and a score, but couldn’t break free for a run over 12 yards. Ivan Webb added 46 yards and a touchdown. Schlagle advances to take on 8-seed St. James Academy, a 42-25 winner over Shawnee Heights. Here is another perfect case study for adding a subjective element to the seeding process. Sure Blue Valley Southwest entered Week 9 with a 1-7 record, but five of the Timberwolves’ losses came by less than seven points in the ultra-competitive Eastern Kansas League. Southwest picked up its only win against state-ranked St. Thomas Aquinas, 30-27. Despite their record, the Timberwolves probably should have been seeded among the top six or seven teams on the east side of 5A. On Friday, Blue Valley Southwest traveled to Pittsburg and used a controlled, short passing game to defeat the 4-seeded Purple Dragons, 26-16. After an initial three-and-out, Pittsburg looked unstoppable in marching down the field and taking a 7-0 lead on a Noah Vaughn touchdown run. While it took the Southwest offense the better part of the first quarter to find its rhythm, Pittsburg missed a couple of opportunities that would later haunt the Dragons. Driving with a 7-0 lead, a penalty forced the Dragons into a field goal attempt. The kicker’s timing seemed to be disrupted on the kick that sailed wide left. Blue Valley Southwest started the second quarter with a 30-yard touchdown pass from sophomore quarterback Will Eldridge to Cooper Ast to tie the game. Pittsburg found itself with a first-and-goal again shortly after. The Dragons ran the fullback Vaughn twice, and Elijah Harris came appeared to extend the ball across the plane on third down but was marked short. On fourth down, the Southwest defense stuffed Pittsburg’s QB sneak on a great play by junior linebacker Nick Allen. Both teams would add field goals to go into halftime tied 10-10. The Timberwolves came out the second half and scored on a 44-yard touchdown pass from Eldridge to Billy Bartlett to lead 17-10. Eldridge added a short touchdown run later in the quarter for a 23-10 lead. The Timberwolves later added a field goal for a 26-10 lead before Pittsburg pulled closer on a Jhalani Long touchdown run. Blue Valley Southwest advances to take on defending 5A champion Mill Valley in a rematch of an earlier Eastern Kansas League meeting won by Jaguars 40-24 back in Week 3. Bonner Springs went into Lansing and came out victorious for a second consecutive week. The Braves dominated this meeting 43-0 after beating the Lions 21-7 last week. Bonner Springs led 19-0 at halftime, and outscored Lansing 24-0 in the second half. The Braves will travel to take on St. Thomas Aquinas next week. Emporia made the long trip to Liberal and came away with a 14-7 victory. The young Spartan team survived a turnover-plagued contest to win the school’s first playoff game since 2012. Emporia will now travel to take on top-seeded Wichita Heights next week. Valley Center held on for a 28-20 win over Newton to advance to the next round of the 5A playoffs. The Hornets, which played without starting quarterback Wyatt Lange due to injury, led the Railers 21-7 in the third quarter before Newton rallied to pull within 21-20. Don Boone added his second rushing touchdown on the night to extend the Valley Center lead to 28-20. Valley Center defeated Newton 21-0 earlier this season. Maize stopped an Ark City two-point conversion attempt with under a minute to go to preserve a 22-20 victory and move on to face Valley Center. The Eagles held a slim 15-14 lead in the fourth quarter when Dalyn Johnson broke free for a 35-yard touchdown run with 1:11 remaining to extend the lead to 22-14. Ark City responded with a 55-yard touchdown pass from Brock Dowler to sophomore Tryee Watkins with a little more than 30 seconds left. Maize stopped the two-point conversion attempt to maintain the 22-20 lead. Maize defeated Ark City 56-33 back in Week 5. Olathe South scored 35 points in the second half to beat rival Olathe East, 35-14. East led 14-0 at halftime, but the Falcons scored early in the third quarter then stopped Olathe East on a 4th-and-1 play to get the ball back in Hawk territory. Oakley Reed scored shortly after to tie the game at 14. Nick Jouret rushed for a pair of touchdowns and tossed a 60-yard touchdown pass to Tre Adger. Reed added two touchdowns on the ground for the Falcons. Gardner-Edgerton scored the winning touchdown with 4:45 remaining in a 23-16 victory over Olathe Northwest. The Blazers and Ravens battled through a back-and-forth contest that featured six lead changes. Northwest led 9-7 at halftime after converting on a field goal as time expired in the first half. Gardner-Edgerton took a 15-9 lead in the second half before the Ravens went up 16-15 midway through the fourth quarter. In the game of the night, Blue Valley North scored on a throwback touchdown pass in double overtime to defeat rival Blue Valley Northwest, 39-36. Grant Hamel’s 1-yard touchdown run with five minutes remaining gave Blue Valley North a 30-23 lead. But the Huskies would dramatically tie the game with seven seconds left on a 21-yard, fourth-down touchdown pass to Darren Gilkey. The two teams would trade field goals as the first overtime ended 33-33. In the second overtime, Blue Valley Northwest could only manage another Hunter Rahto field goal for a 36-33 lead. Blue Valley North would win the game on a 10-yard, throwback touchdown from Cole Chapman to tight end Dylan Freberg. Blue Valley North led 17-14 at halftime after building a 10-point first-quarter lead. Both teams added field goals in the third quarter and Northwest took a 23-20 lead on a Garrett Tierney touchdown. North later tied the game at 23 on a field goal midway through the fourth quarter. Things went much like we expected in Week 9 of Class 4A, Division I.
Basehor-Linwood and KC Piper advanced out of the classification’s toughest district. The Bobcats claimed the District 1 title with a 27-12 win over Tonganoxie, while J.J. Letcher led Piper to another victory in beating Atchison, 40-19. A playoff spot was on the line in District 3 as the winner of the rivalry game between Louisburg and Paola would be the district runner-up behind Ottawa. Louisburg defeated the Panthers 35-7 behind a 4-touchdown performance from Austin Moore. It was Louisburg’s first win over Paola since 2010. In District 4, Labette County entered Friday with an 0-2 district record, but still had a chance to get into the playoffs. The Grizzlies did their part by going out and blasting Coffeyville 40-0. Labette’s win over the ‘Nado coupled with Chantue’s loss to Independence allowed the Grizzlies to win the runner-up playoff spot. Labette County finished in a three-way tie with Chanute and Coffeyville, but advances to the playoffs by virtue of having the most district marginal points of the three schools. In Distirct 8, McPherson won the championship with a 28-7 win over Abilene. The Abilene loss meant the Cowboys fell to 1-2 in district play after being upset by Hays 23-12 last week. Hays, however, went on the road and lost 30-13 to Wamego forcing a three-way tie for the runner-up spot. In the end, Abilene advances as the District 8 runner-up with more marginal points than Hays and Wamego. Defending champion Holcomb rebounded from last week’s loss to Pratt with a 40-point win over Hugoton. The Longhorns had to beat the Eagles in order to reach the playoffs and have a shot at defending their 4A-II crown. Holcomb left little doubt in building a 21-7 halftime lead en route to the 47-7 win. Dillon Williams caught a touchdown pass, broke a 75-yard touchdown run in the third quarter and an 11-yard touchdown run in the fourth quarter. Holcomb’s runner-up finish in the district means the Longhorns will travel to GWAC rival Scott City to open the playoffs. Holcomb defeated Scott City 32-13 back in Week 2. In District 6, Smoky Valley stopped a Clay Center two-point conversion in overtime to win the championship, 30-28. Smoky Valley will host Nickerson in the first round of the playoffs, while Clay Center will travel to Wichita Collegiate. Washington County won the District 2 championship by defeating Valley Heights, 42-36. The Tigers and Mustangs were tied 22-22 at halftime. Washington County returned a Mustang fumble 85 yards for a touchdown to regain the lead 34-30 early in the fourth quarter. Valley Heights would score with 3:20 remaining to take a 36-34 lead, but the Tigers pushed across the winning points with a touchdown with 1:18 remaining. Washington County will host Jefferson County North in the first round of the 2-1A playoffs next week, while Valley Heights will travel to No. 1 Troy. The Mustangs lost to the Trojans 58-27 to open the season. Having dropped a 14-7 decision to Chase County to begin district play, the Olpe Eagles needed to beat undefeated Lyndon in order to qualify for the 2-1A tournament. The Eagles did just that, scoring 13 points in the fourth quarter to defeat the Tigers, 26-20. Blaine Hinrichs provided the winning touchdown for Olpe on a 55-yard run with three minutes remaining. The loss was Lyndon’s first of the season, but the Tigers still won the District 3 championship by finishing +28 in district margin points ahead of Olpe (+20) and Chase County (+15). Lyndon will host Oswego in the first round of the playoffs, while Olpe will travel to St. Mary’s Colgan. We were not able to recap Thursday’s action, but we’ll go over THE most eye-popping thing from the night’s action. Yes, you read that right. Onaga scored 114 points in a game. Or you can think of it this way, Valley Falls scored 68 points and got 45’d! The Buffaloes and Dragons set numerous records on Thursday night including the most combined points in a game with 182. Onaga’s Logan Marten rushed for 323 yards and six touchdowns in the game. Marten also passed for 334 yards and 9 touchdowns! That’s right, he accounted for 15 total touchdowns on Thursday night. Onaga receiver Tyler Herrman caught 11 passes for 276 yards and eight touchdowns. Valley Falls’ Tyler Lockhart attempted 79 passes, completing 37 of them for 465 yards and five scores. Texas Tech would be proud. Onaga led 32-6 after the first quarter, 54-22 at halftime, 70-42 after three quarters, and then outscored the Dragons 44-26 in the fourth quarter.